Help spread kindness by giving food to your local food bank. Hunger has no boundaries. It exists everywhere in America: in cities, in suburbs, and in the country. They are neighbors in our community. You can help spread kindness by giving food to your local food bank. Find local food banks that serve your community using the Food Bank Locator from FeedingAmerica.org. 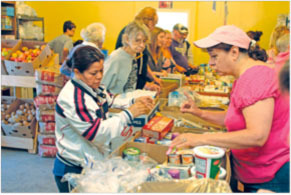 Bring food to the food bank and they will give it to families in need. Find & Select a food bank as your favorite non-profit to benefit from every CommonKindness coupon you redeem. Be proud that you have helped a family in need and know that many people are grateful to you, including everyone at CommonKindness. Thank you! 1 in 6 Americans do not have access to enough food. Nearly 49 million Americans experience "food insecurity" each year - that is, they are not sure where they will find their next meal. 17 Million American children live in homes where there is not enough to eat. 36% of served households have one working adult. Seniors are shown to be among the most consistent pantry clients. The majority of people seeking food assistance rely on food pantries as a supplemental food source to meet monthly shortfalls in food. Save money and help your local food bank!